Hand held Broom Feature: Sweeping the floor and mopping the floor; hand-pushing operation, easy to sweep the floor; no wires bound. What is a hand-push broom? The hand-pushing broom, as the name suggests, is a broom that automatically sweeps the floor with a hand. Unlike traditional brooms, it needs to sweep the garbage into a pile and then sweep it into the shovel. It may also leak during the sweep. It automatically absorbs trash, just as magnets attract each other. Compared with ordinary broomsticks, hand-pushing brooms must be more labor-saving and time-saving. The hand-pushing broom has a large cleaning area. It only needs to push it over the garbage. The garbage can be automatically absorbed into the garbage box. It is no longer necessary to sweep the garbage into a pile, and then take it over and sweep the garbage into it. When the ordinary broom sweeps the floor, it usually raises a burst of dust, which will cause secondary pollution in the room and cause physical discomfort. The hand-pushing broom does not have this problem. Because it is directly covered in the garbage when the garbage is adsorbed, the path that the dust runs out is blocked, and the dust is absorbed together while the garbage is adsorbed. Another advantage of the push-type broom is that there is no noise. We all know that some vacuum cleaners make a lot of noise during use, which can easily affect the rest of the family. The hand-pushing broom does not make a loud sound because there is no electric motor. You can clean the room anytime, anywhere. Affect family rest. The hand-pushing broom does not require electricity, so it is not limited by the wires. It is possible to clean which room and which room to clean. Unlike vacuum cleaners, which need to be charged all the time, the length of the wires is limited. It is often inconvenient to remove the plug for another place after sweeping one place. Even with a wireless vacuum cleaner, the length of use is limited, unlike a hand-pushed broom that can be used. In addition to being able to absorb rubbish, the push-type broom also has the function of a mop. The bottom of the hand-held broom box is equipped with a microfiber cloth that can be wet and dry. 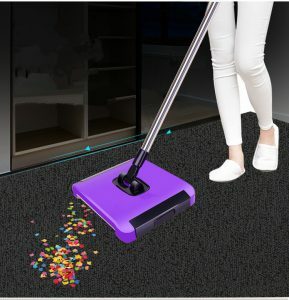 When you have finished sweeping the floor, you can drag the floor clean and it is very convenient. 1. Customer provided design drawings.